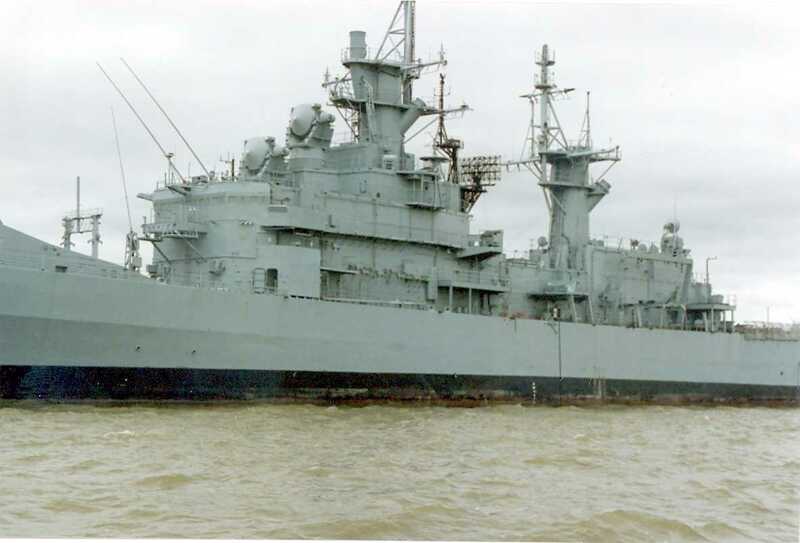 Fate Sold for scrap to International Shipbreaking LTD, Brownsville, TX. 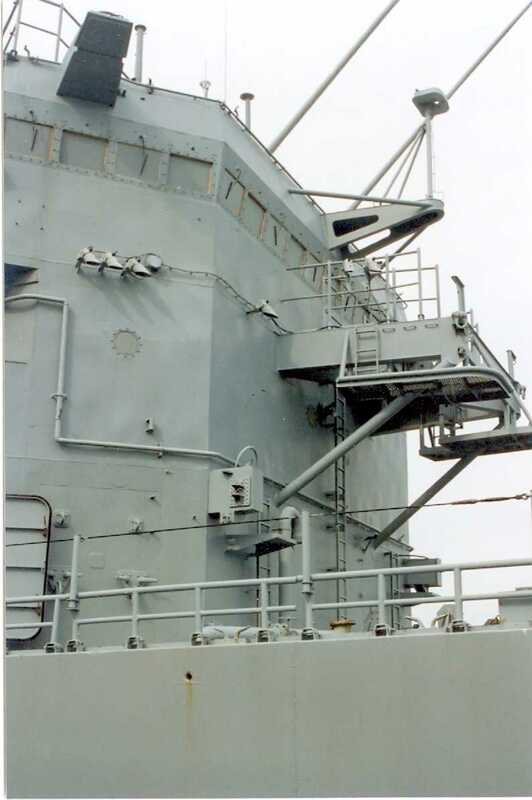 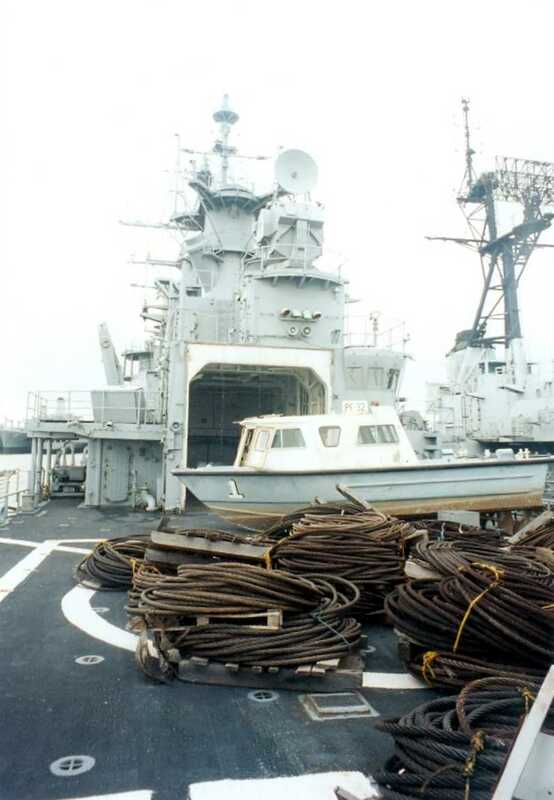 Scrapping completed 08 NOV 1999. 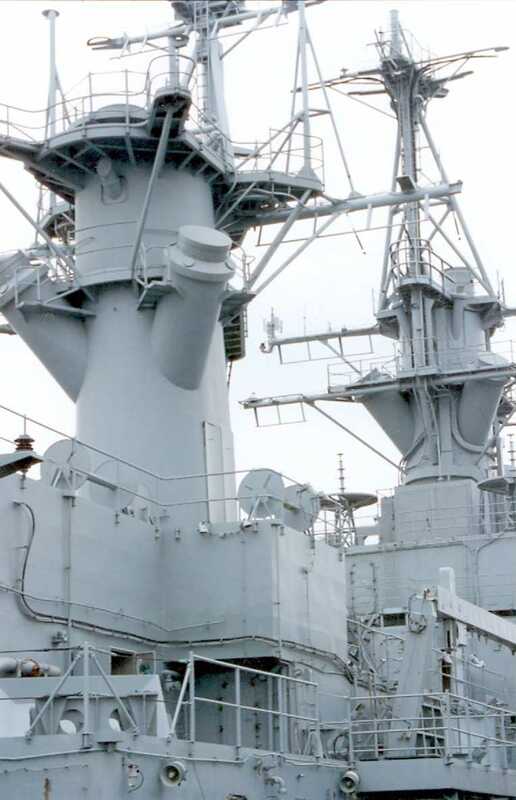 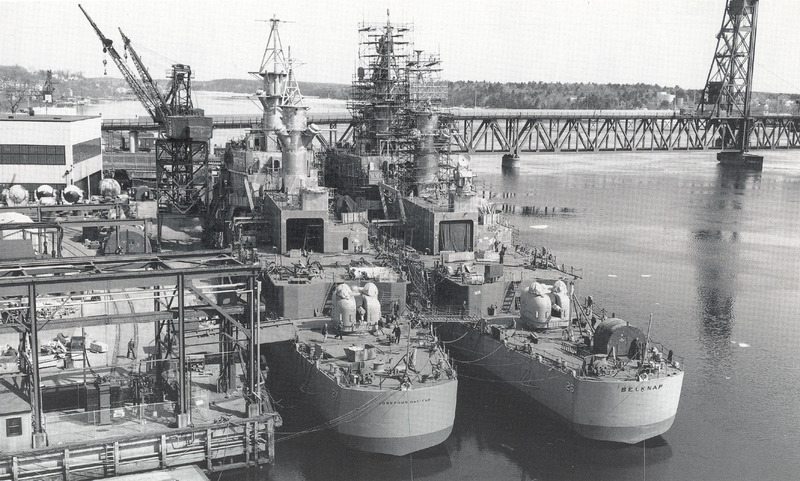 100k Seen here at Boston Naval Shipyard, June 1965. 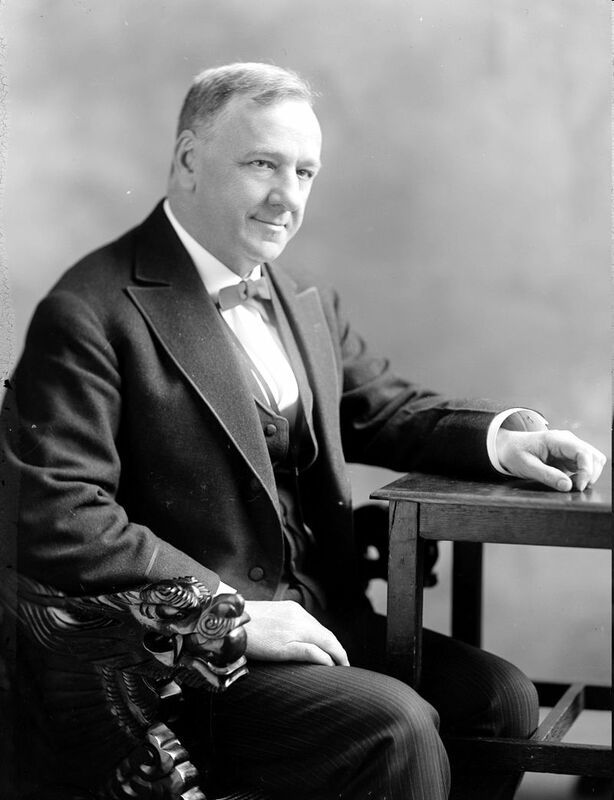 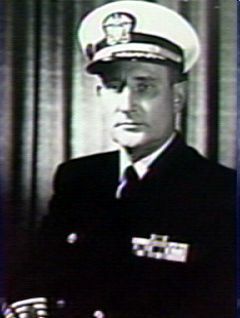 Richard Leonhardt. 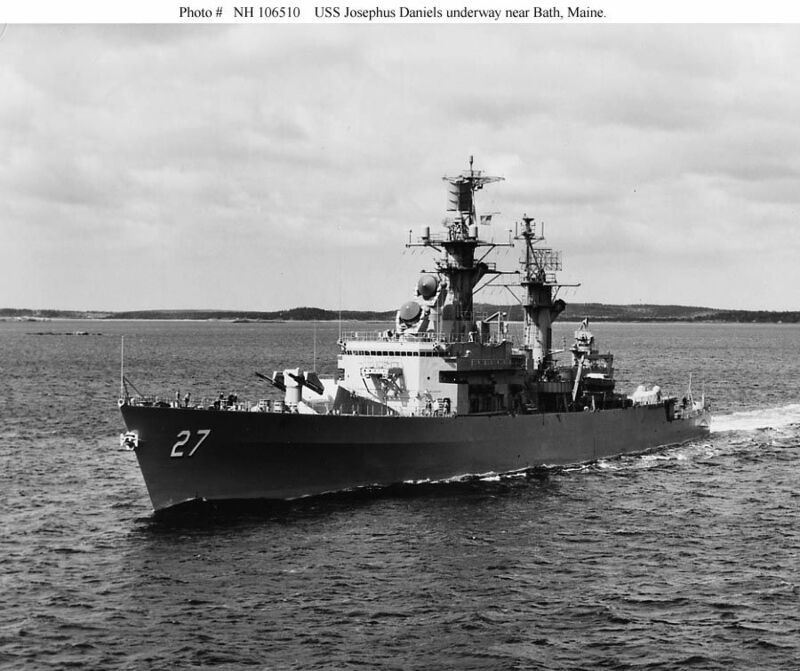 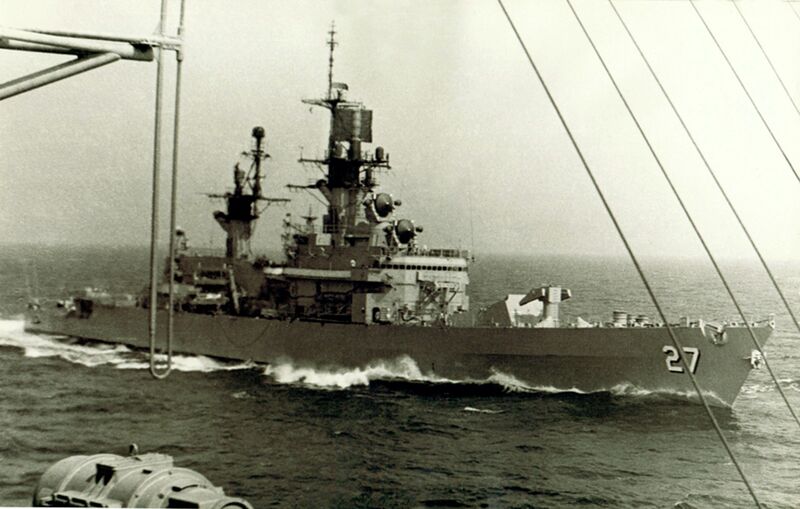 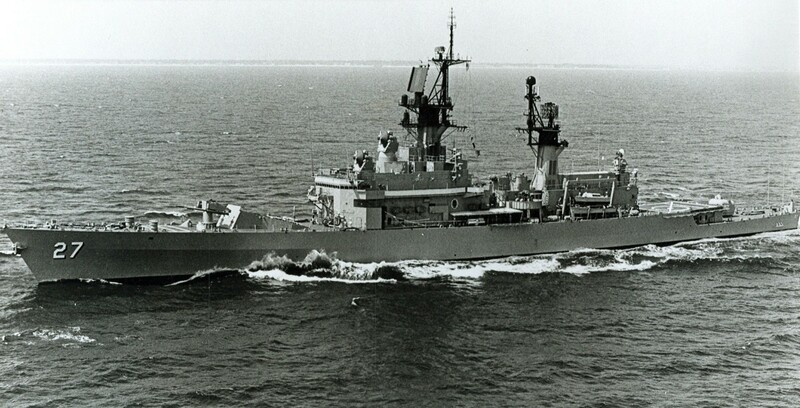 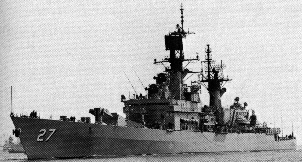 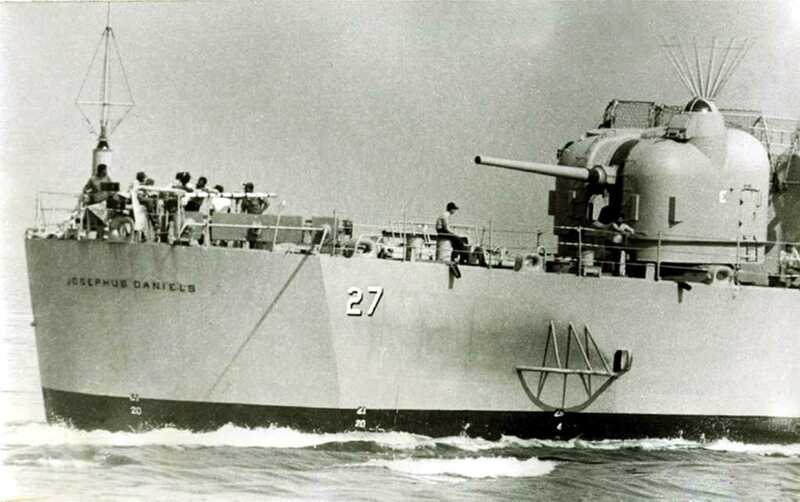 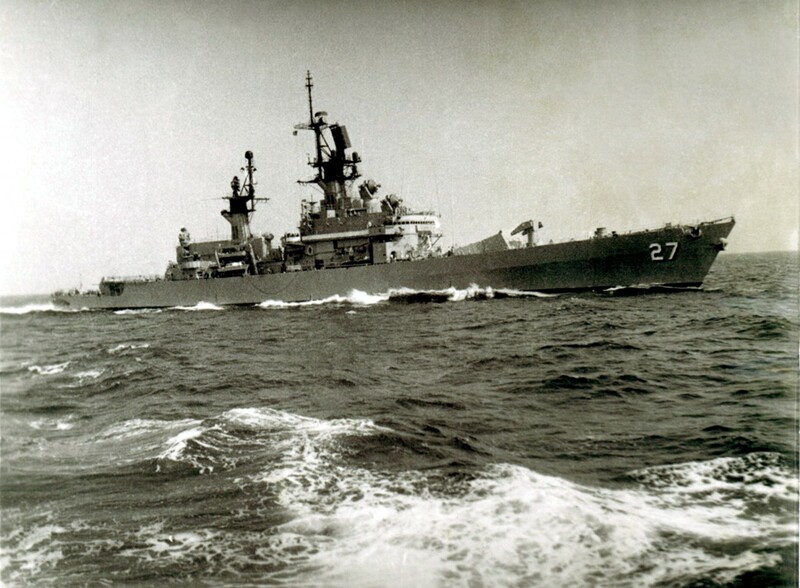 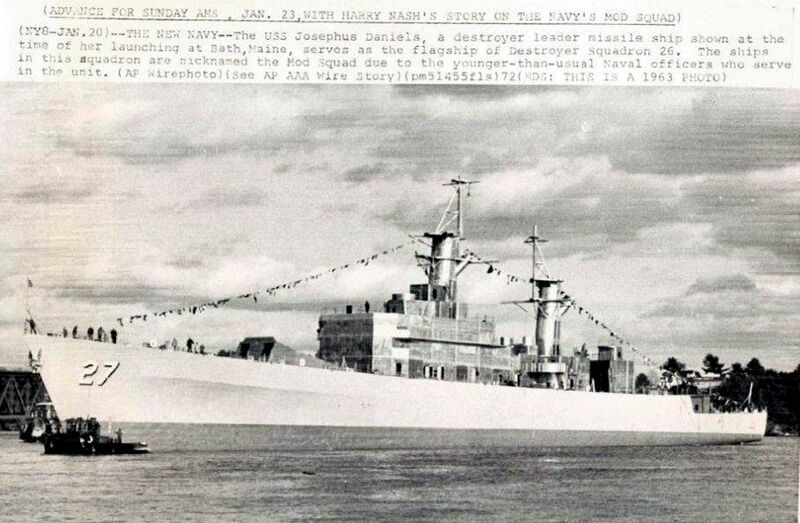 USS Josephus Daniels (DLG 27) underway during sea trials near Bath, Maine, circa March 1965. 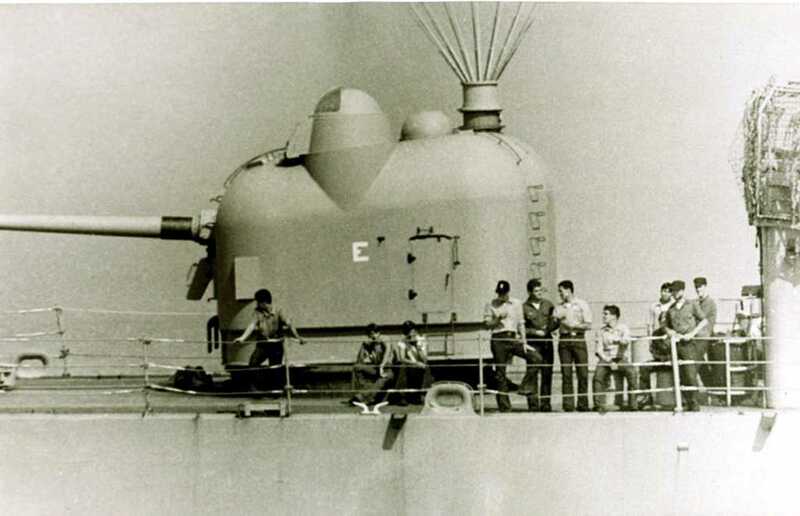 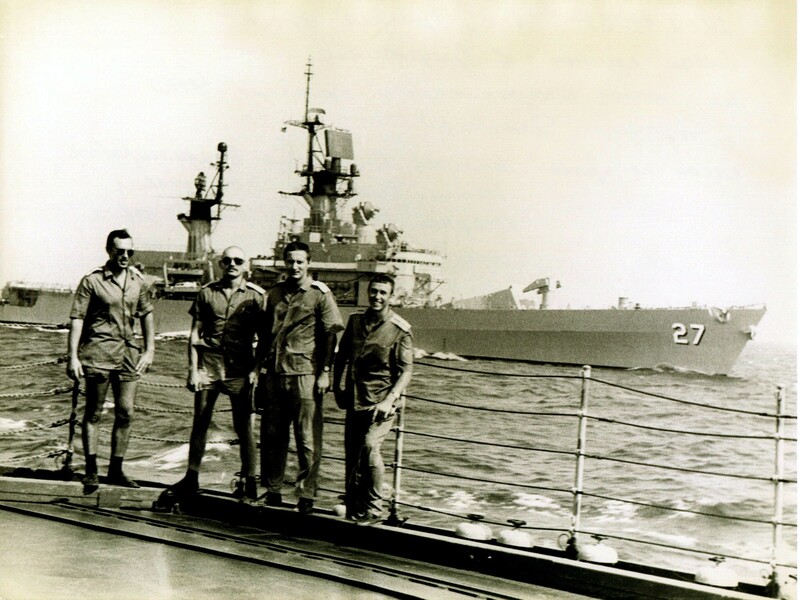 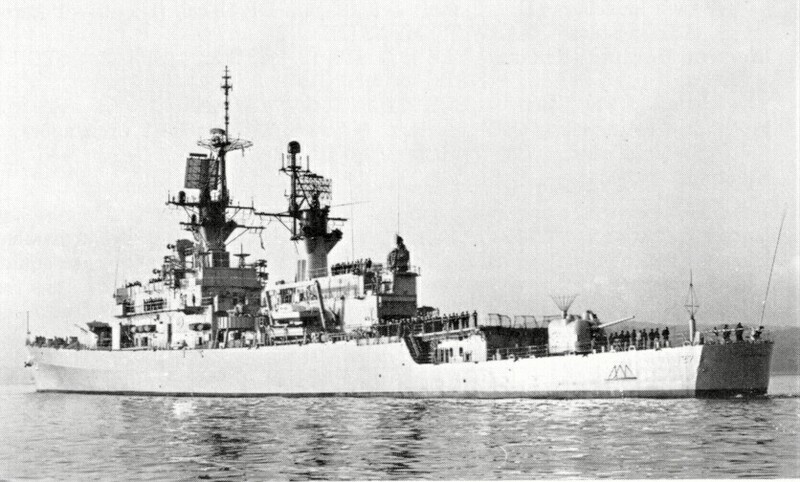 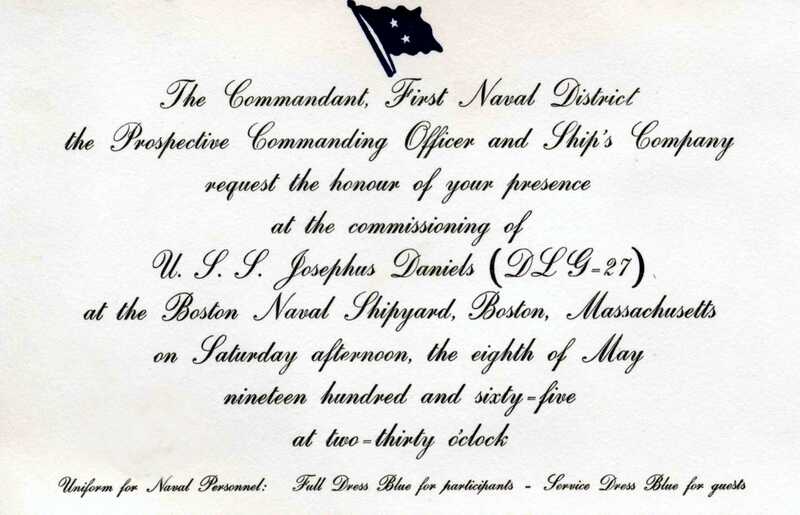 Photograph received by the Naval Photographic Center on 5 April 1965. 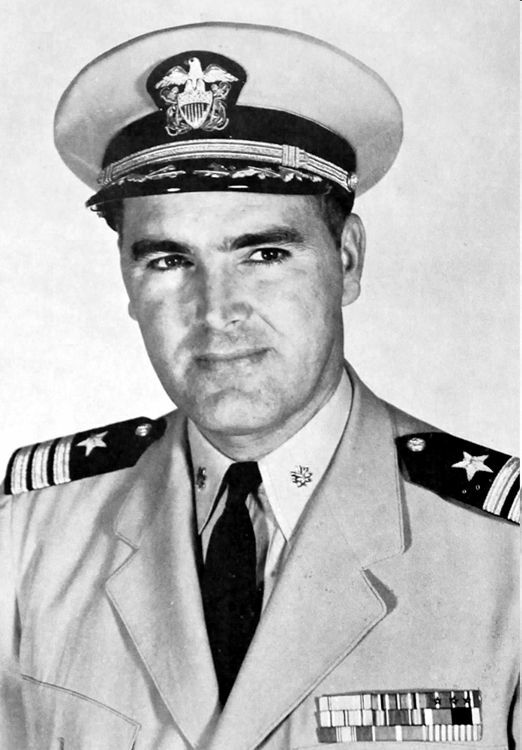 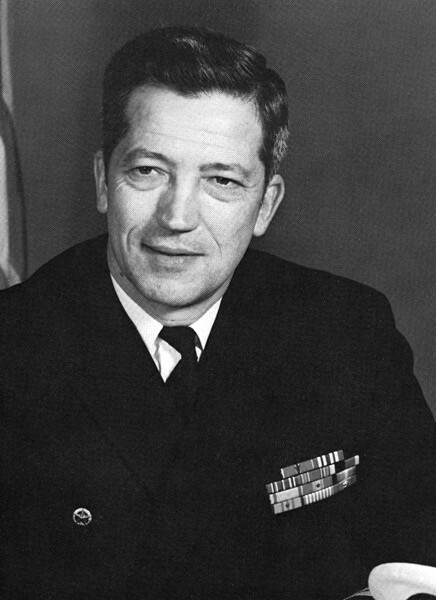 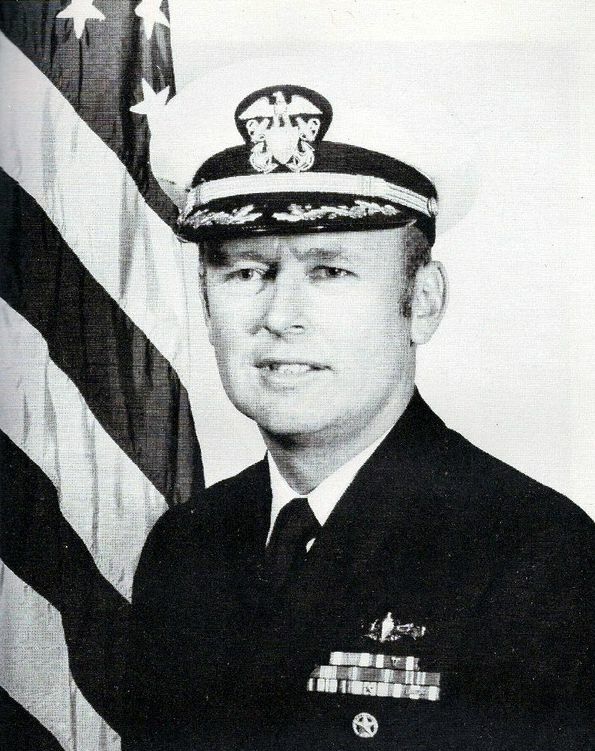 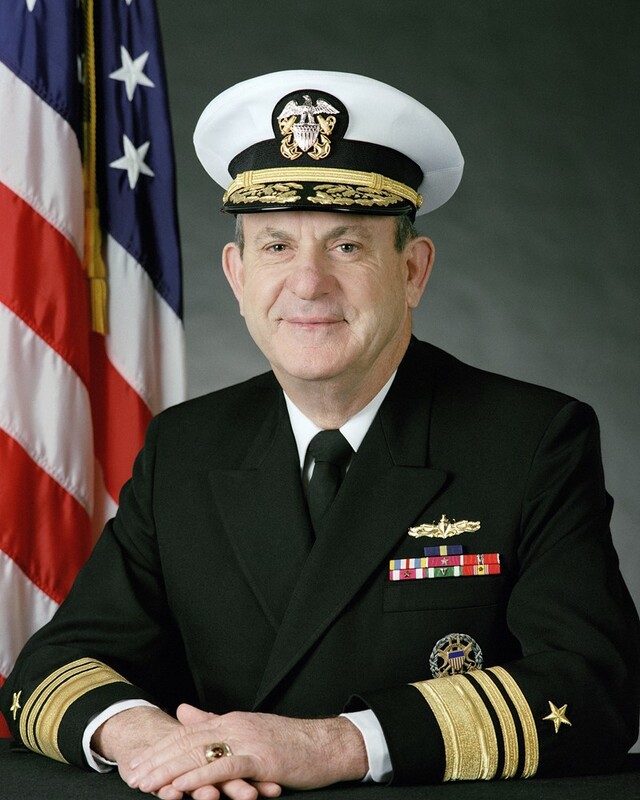 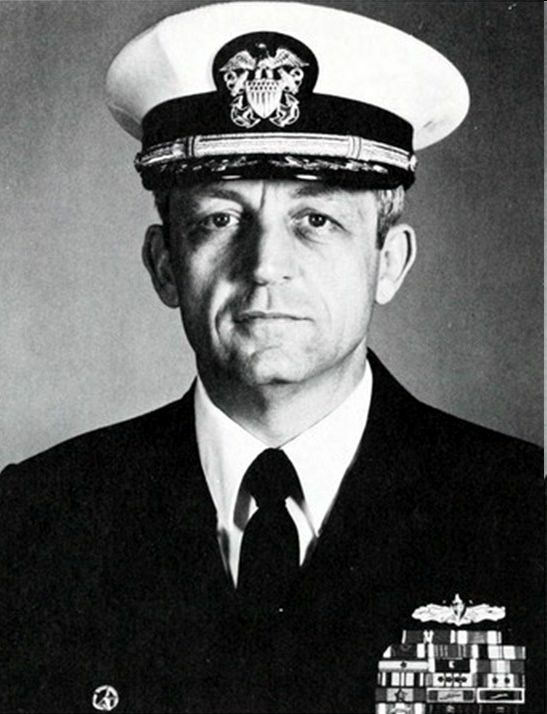 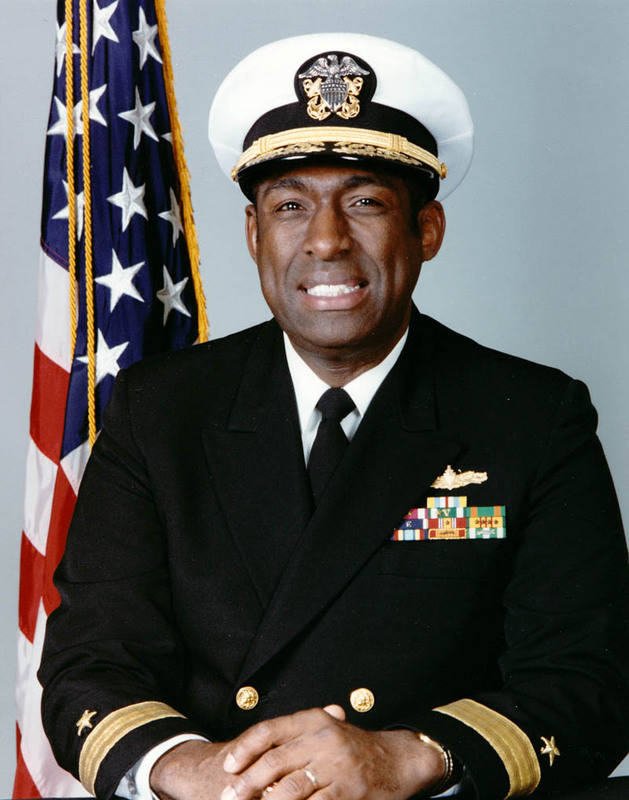 Official U.S. Navy Photograph, from the collections of the Naval History and Heritage Command. 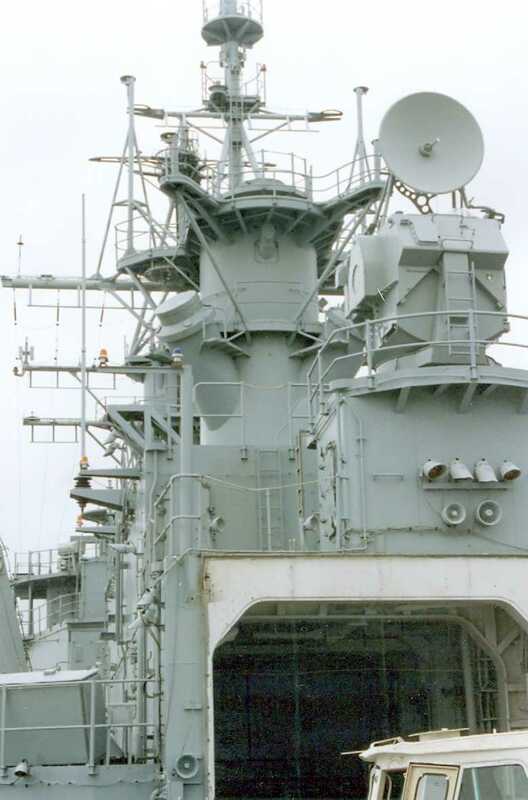 Photo #NH 106510. 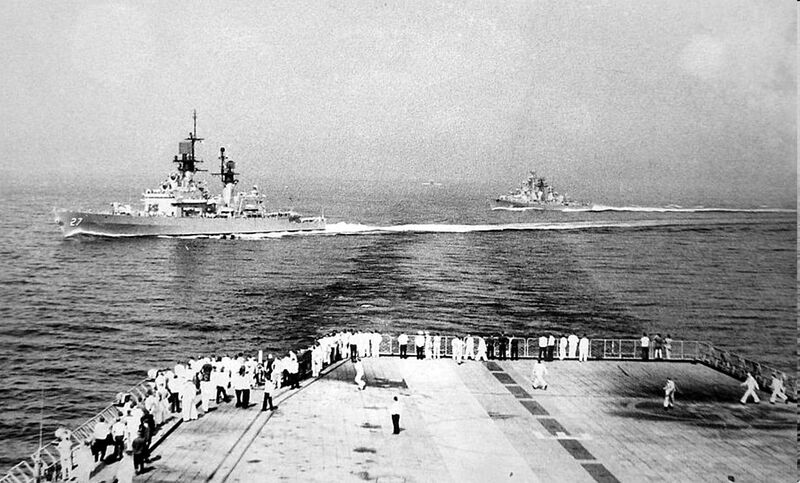 04012743 198k 30 July 1976 - The Western Med. 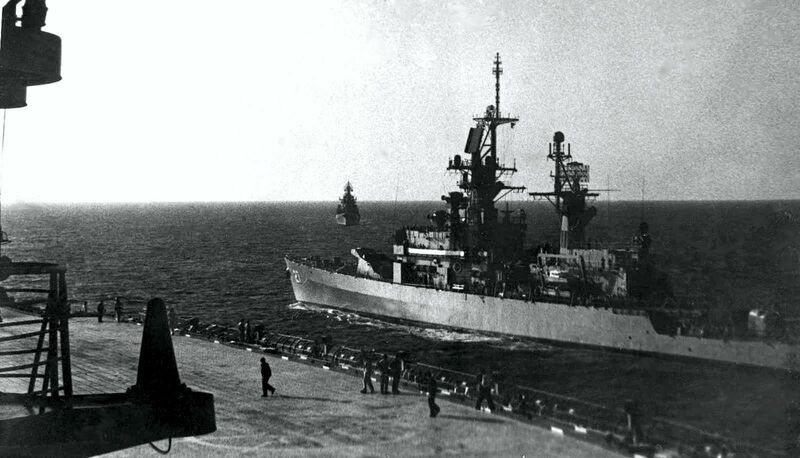 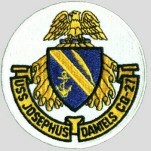 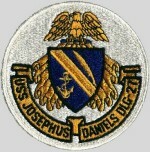 The USS Josephus Daniels as she shadowed the KIEV's Battle Group formation. 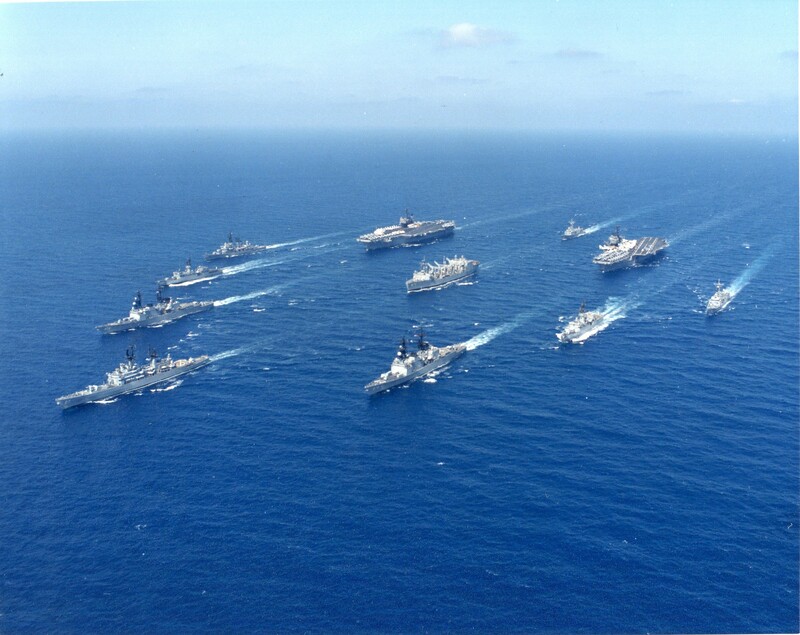 An aerial port view of the nuclear-powered aircraft carrier USS Nimitz (CVN 68), the replenishment oiler USS Kalamazoo (AOR 6), the guided missile destroyer USS Richard E. Byrd (DDG 23) and the guided missile cruiser USS Josephus Daniels (CG 27) underway. 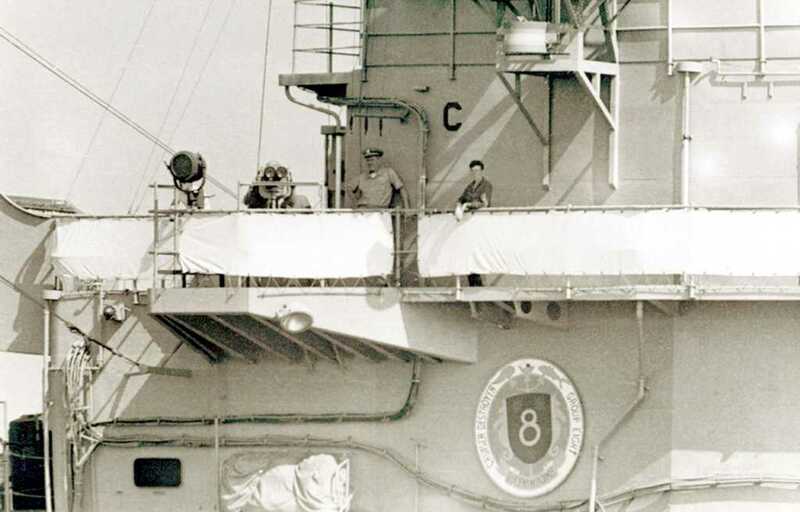 The ships are part of Carrier Group Eight. 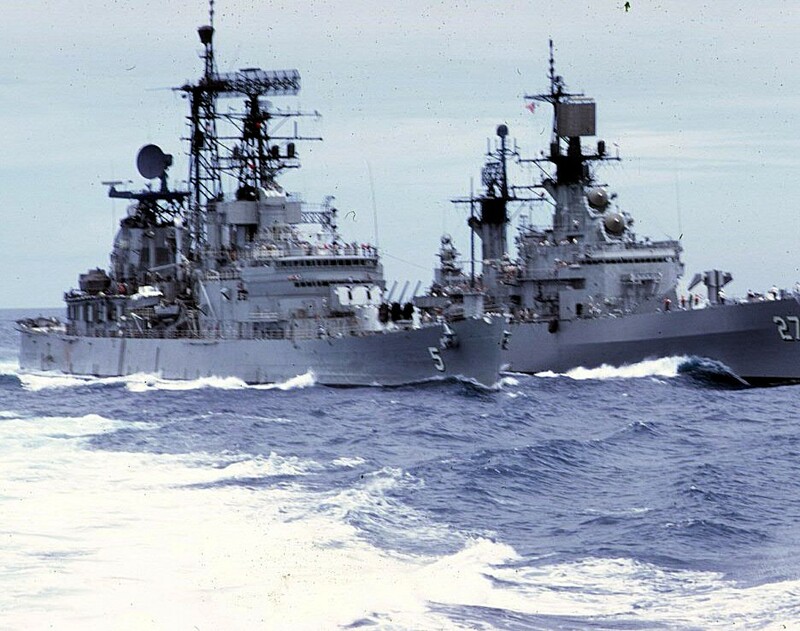 Photo by PH1 R. Beno, February 5 1987. 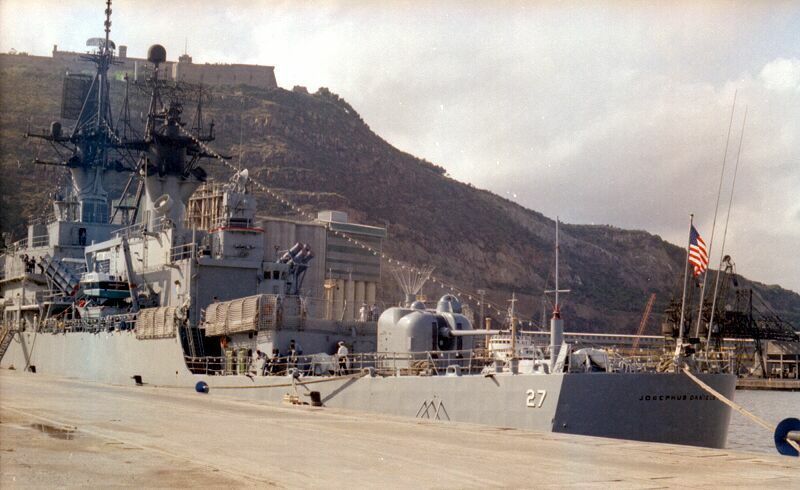 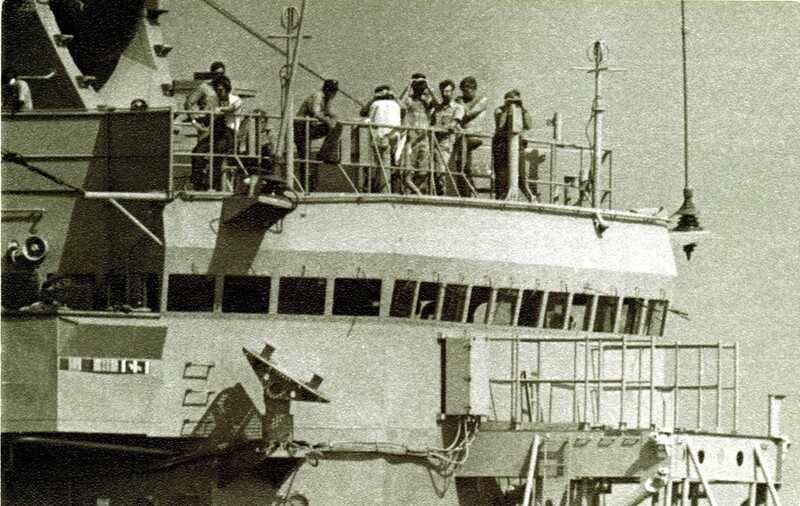 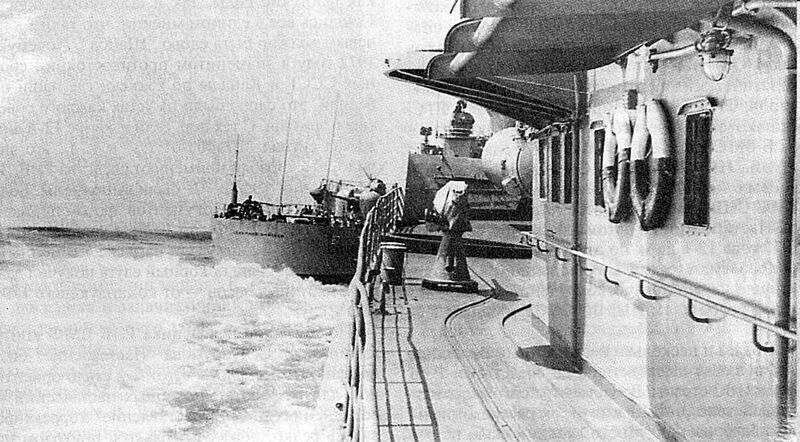 Turnover in the Mediterranean, 17 June 1987. 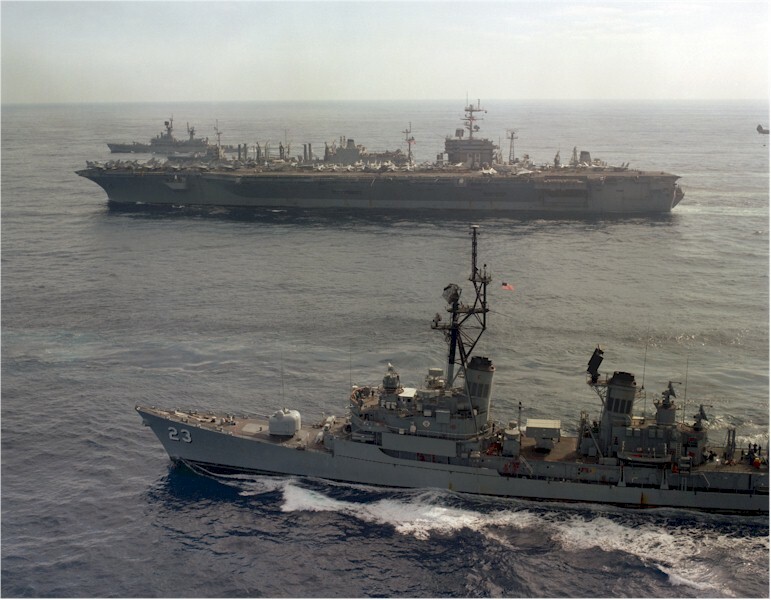 Clockwise from top center: USS Kitty Hawk (CV 63) with Carrier Air Wing (CVW) 9, en route to Philadelphia; guided missile frigate USS Hawes (FFG 53); USS Saratoga (CV 60) with CVW-17, newly arrived in the Med from Mayport; guided missile frigate USS Doyle (FFG 39); frigate USS W.S. 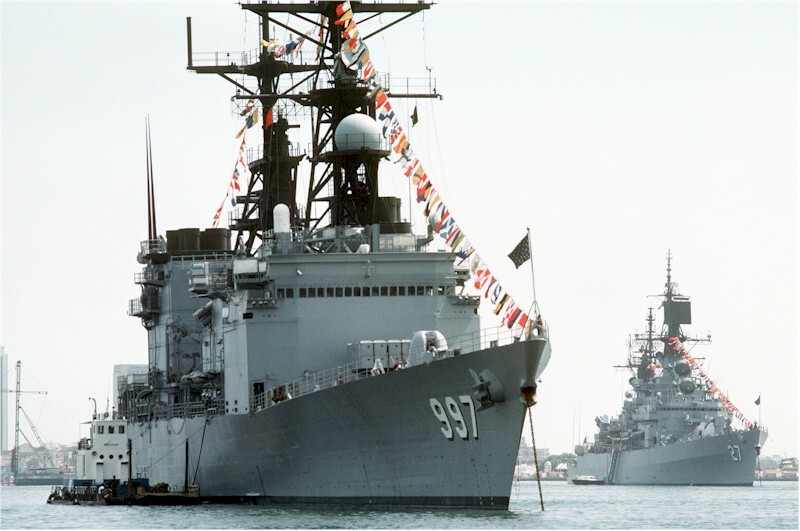 Sims (FF 1059); destroyer USS Comte de Grasse (DD 974); guided missile cruiser USS Josephus Daniels (CG 27); destroyer USS Conolly (DD 979); frigate USS Truett (FF 1095); and guided missile destroyer USS William V. Pratt (DDG 44). 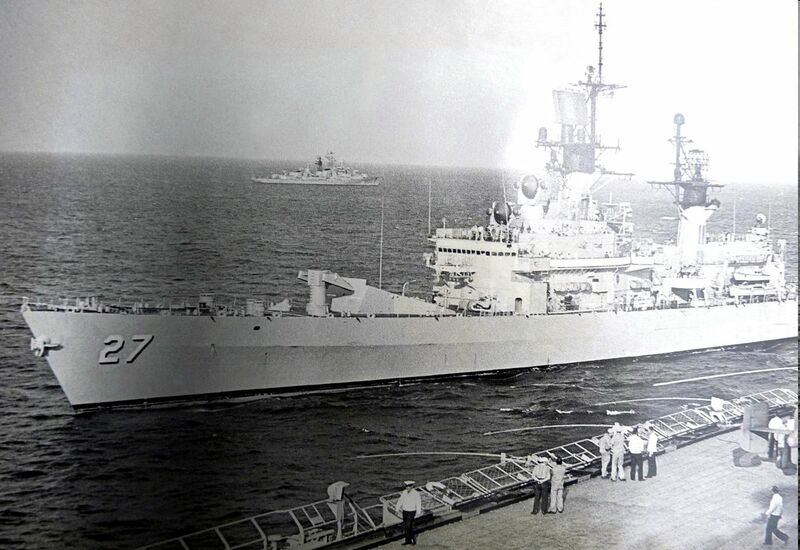 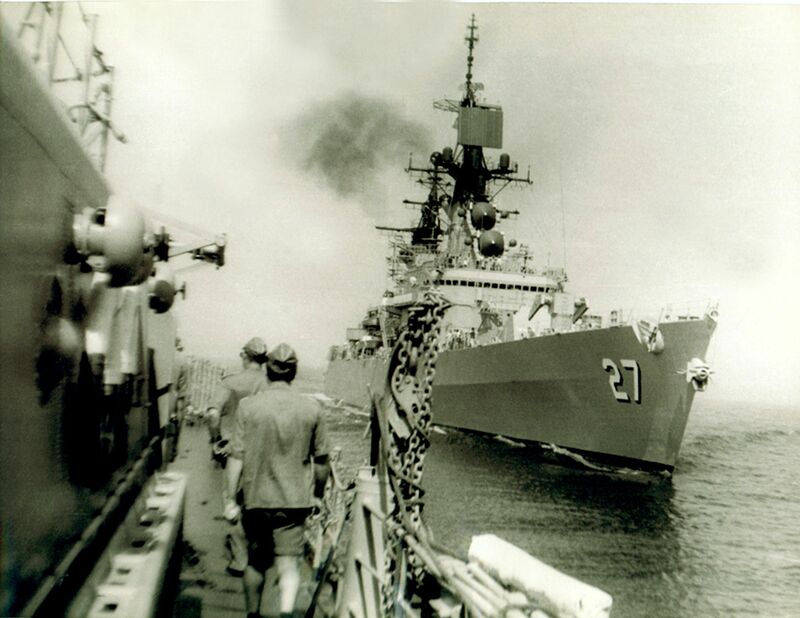 Replenishment oiler USS Kalamazoo (AOR 6) is steaming in the center of the formation. 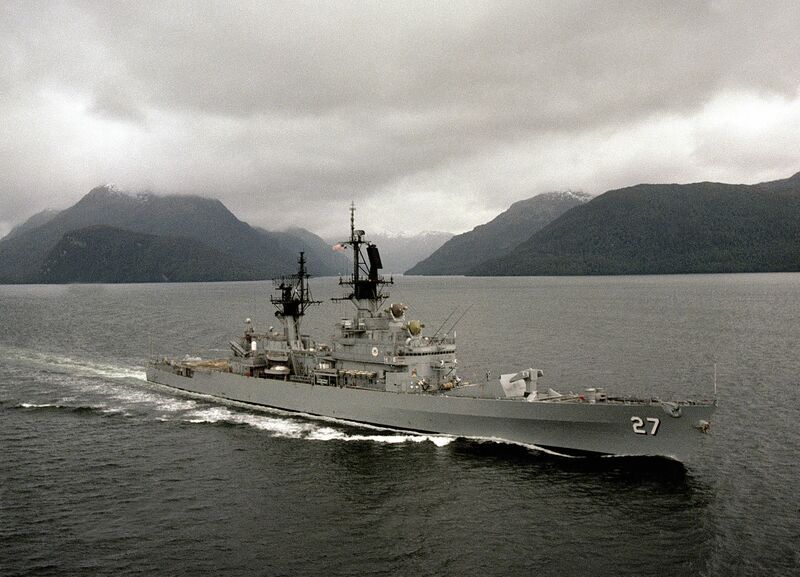 U.S. Navy photo by PH2 Thomas Hensley. 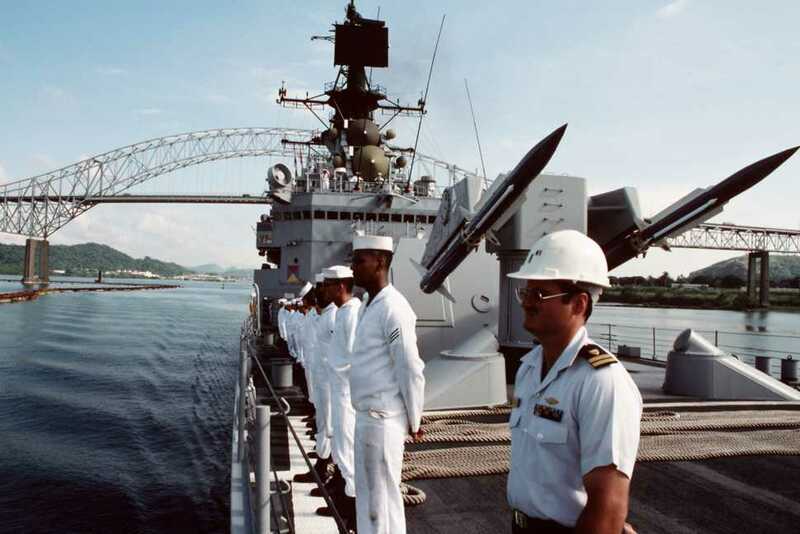 Sailors man the rails aboard the guided missile cruiser USS Josephus Daniels (CG 27) as the ship enters port during Unitas XXXI, an annual, joint exercise between the U.S. Navy and the naval forces of nine South American countries. 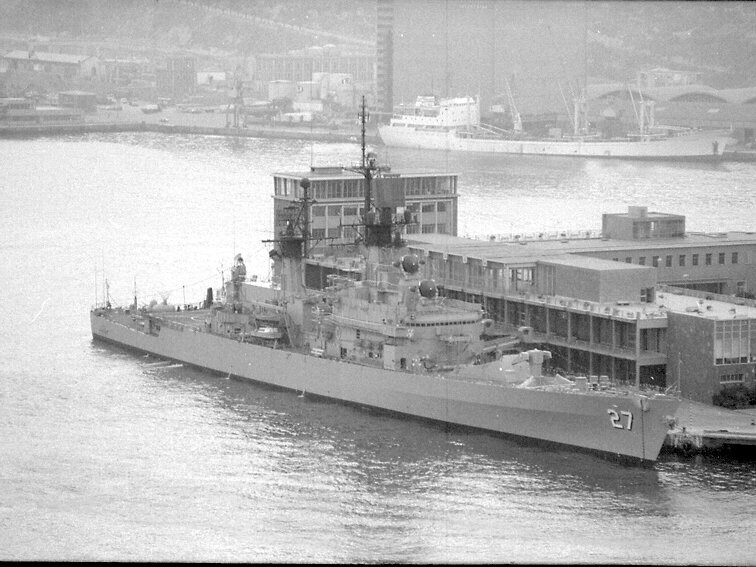 Photo by PH1 Michael D.P. 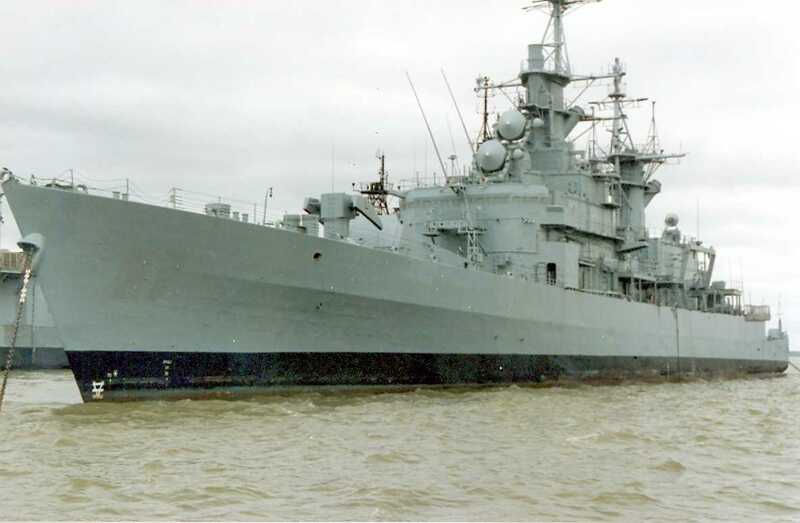 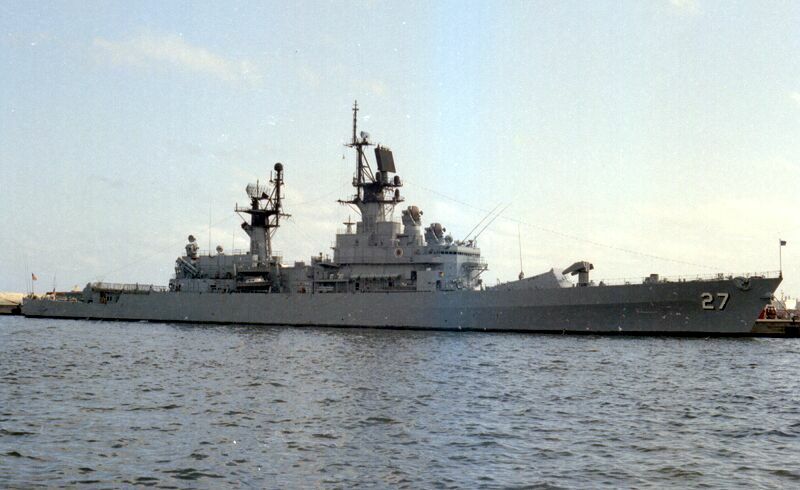 Flynn, 01 January 1990. 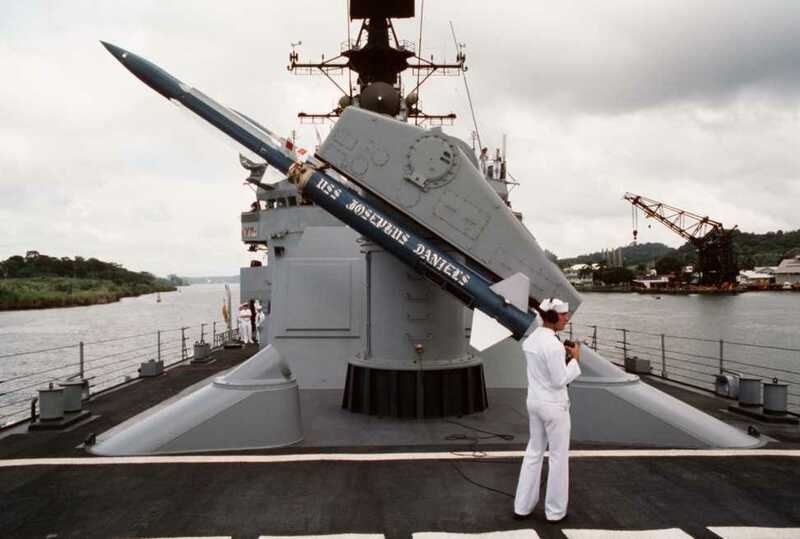 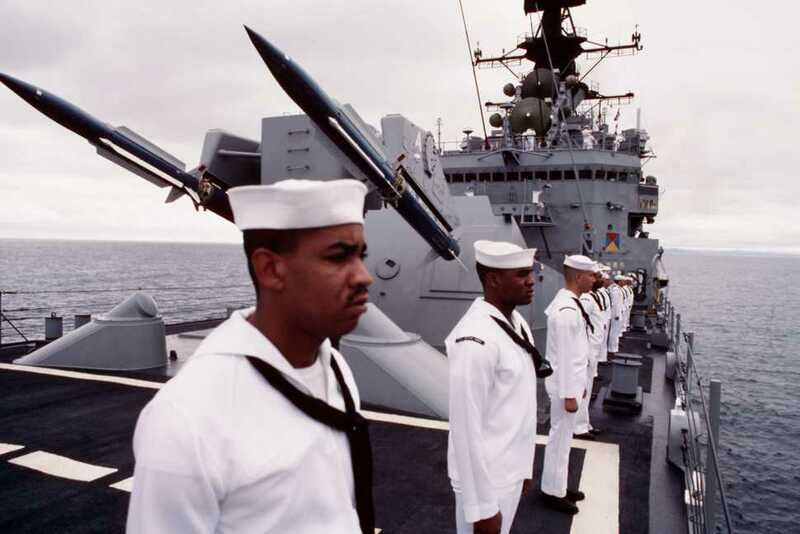 Sailors man the rails as officers stand beneath the TSAM's (Training Surface-to-Air Missile) on the Mark 10 launcher aboard the guided missile cruiser USS Josephus Daniels (CG 27). 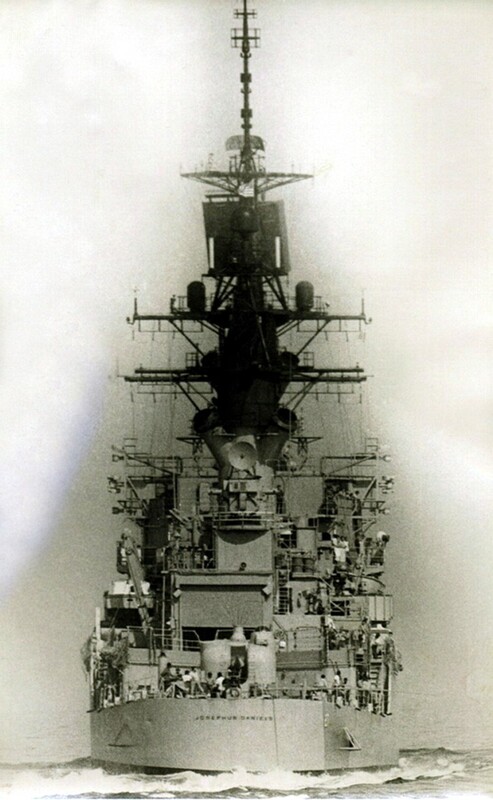 Photo by PH1 Michael Flynn, January 1 1990. 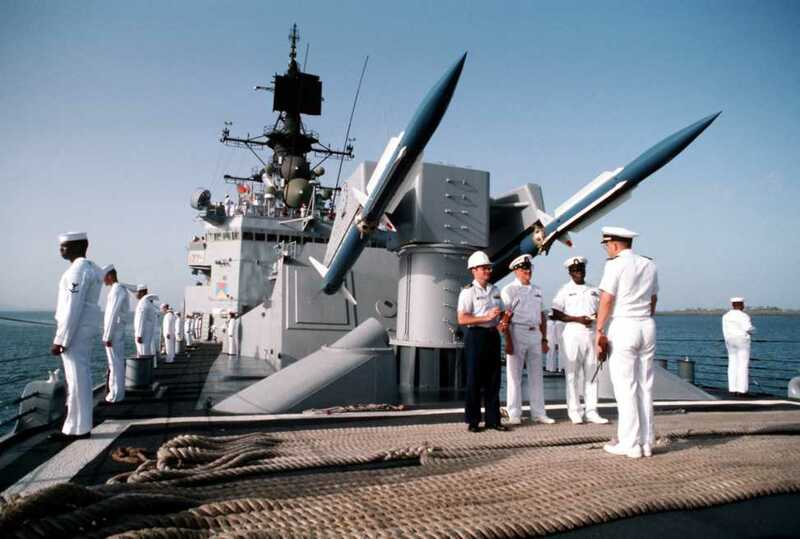 A Safety Observer communicates with the Missile House while the Mark 10 launcher is exercised aboard the guided missile cruiser USS Josephus Daniels (CG 27). 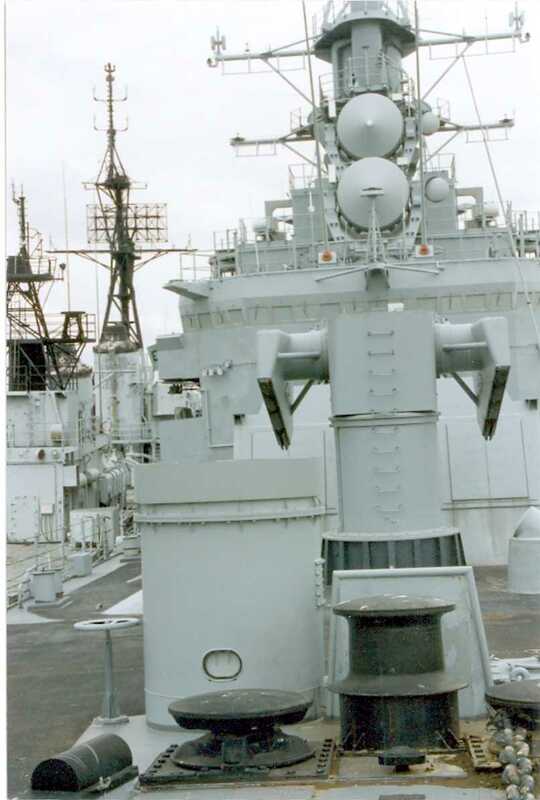 Photo by PH1 Michael Flynn, January 1 1990. 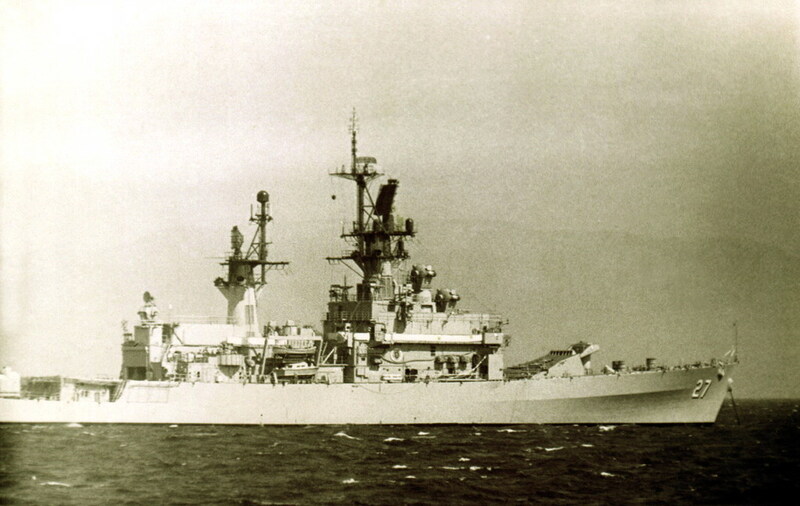 Photo by PH1 Michael Flynn, 01 January 1990. 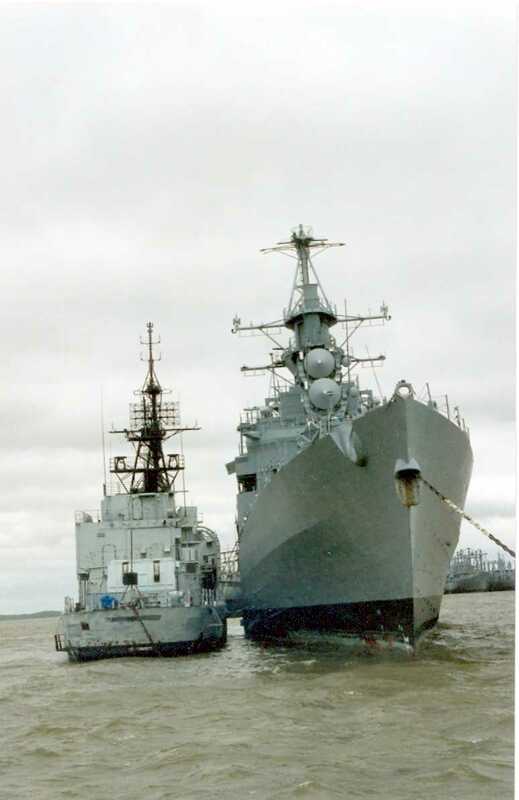 The destroyer USS Hayler (DD 997) and the guided missile cruiser USS Josephus Daniels (CG 27) lie at anchor while visiting a port during Unitas XXXI, an annual, joint exercise between the U.S. Navy and the naval forces of nine South American countries. 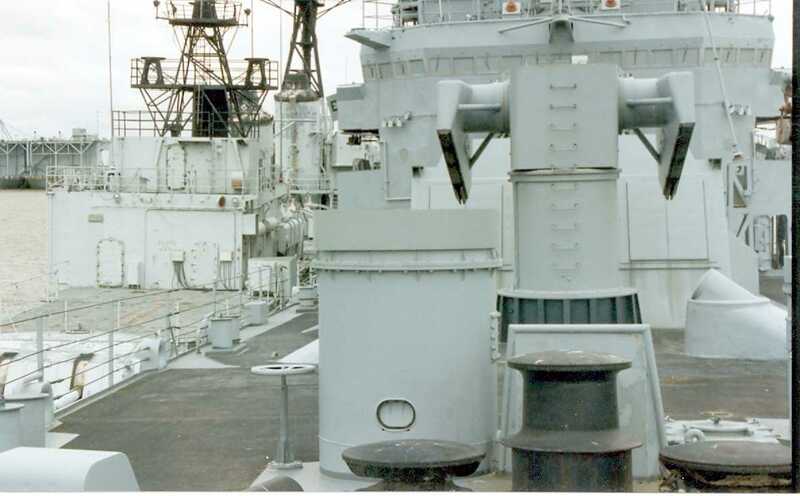 Photo by PH1 Michael Flynn, January 1 1990. 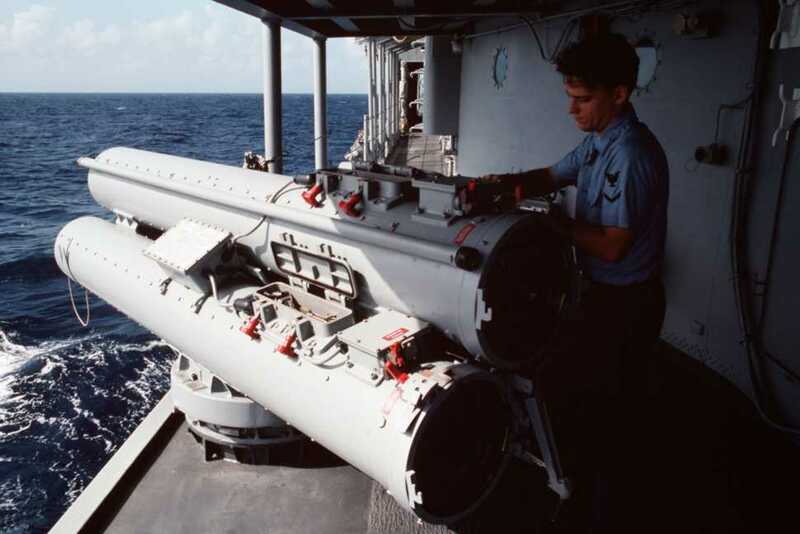 Torpedoman's Mate 1st Class Hans D. Defor performs maintenance on the Mark 32 torpedo tubes aboard the guided missile cruiser USS Josephus Daniels (CG 27) as the ship is underway during Unitas XXXI, an annual, joint exercise between the U.S. Navy and nine South American nations. 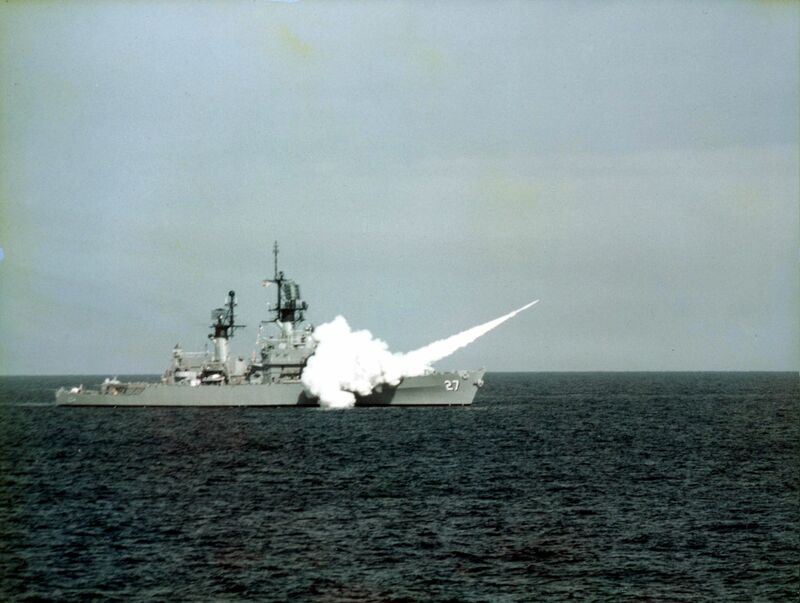 Photo by PH1 Michael Flynn, 01 January 1990. 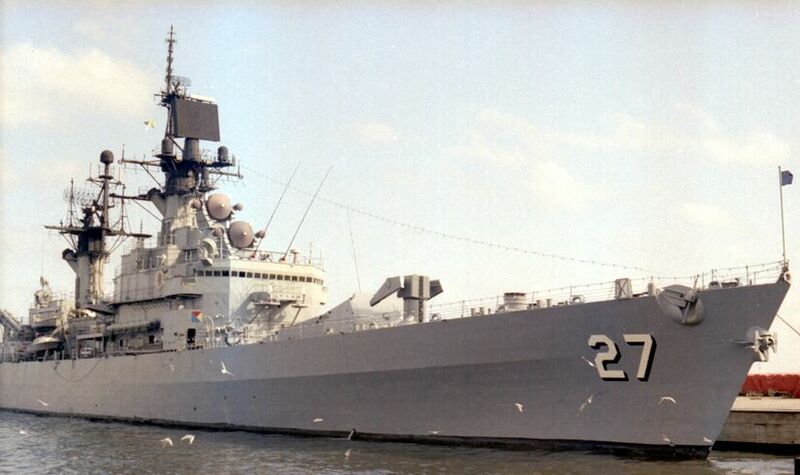 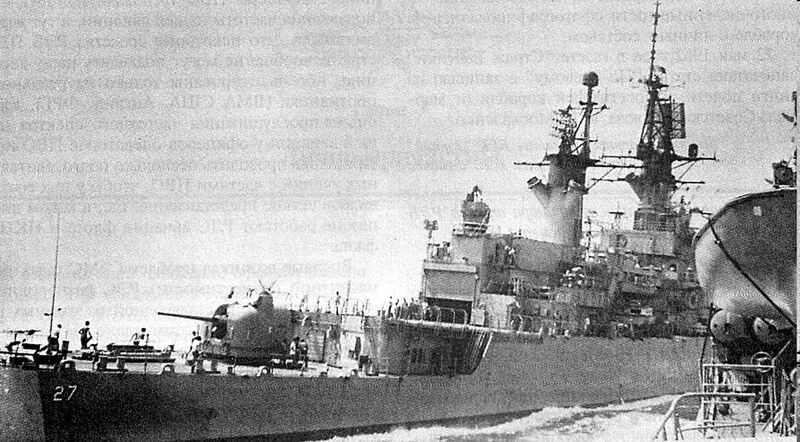 Starboard bow view of the guided missile cruiser USS Josephus Daniels (CG 27) underway in the Straits of Magellan on 01 July 1990 during Unitas XXXI, a combined exercise involving the naval forces of the United States and nine South American nations. 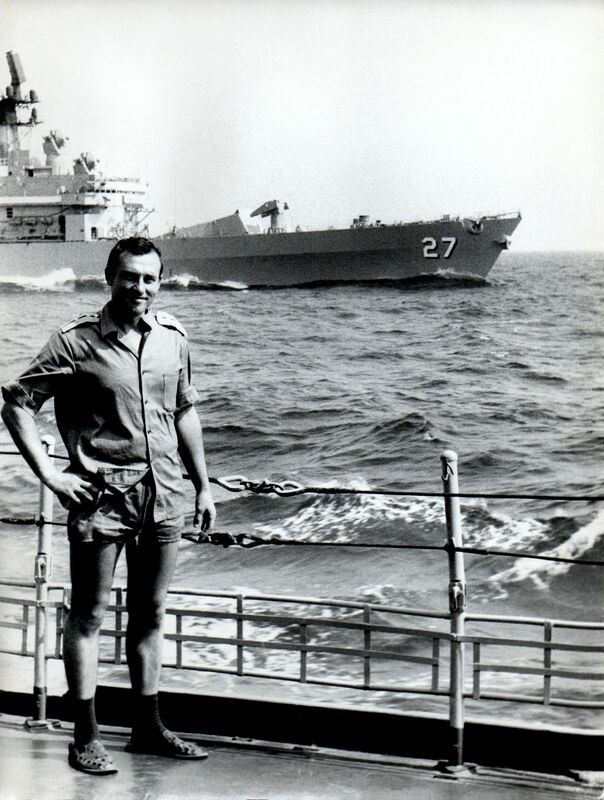 PH1 Michael D. P. Flynn, U.S. Navy photo #DN-SC-92-03068. 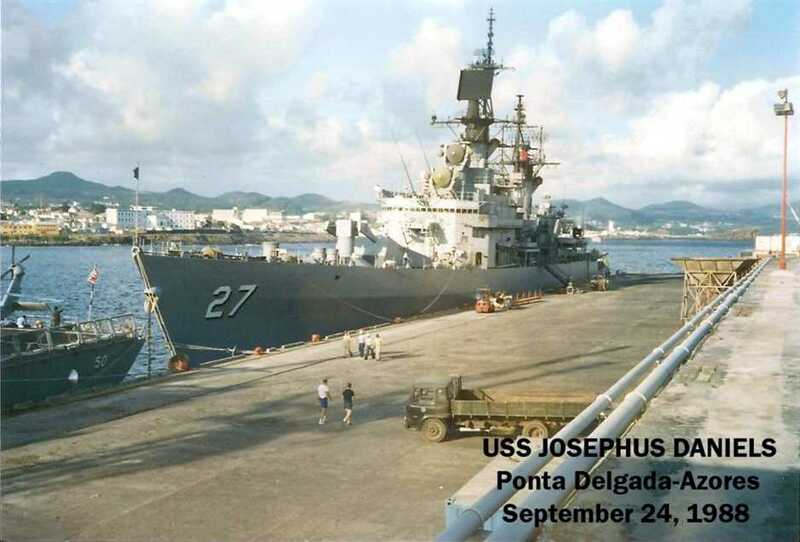 LT Robert Watts mans the rails with his division aboard the guided missile cruiser USS Josephus Daniels (CG 27) after the ship passes under the Bridge of the Americas. 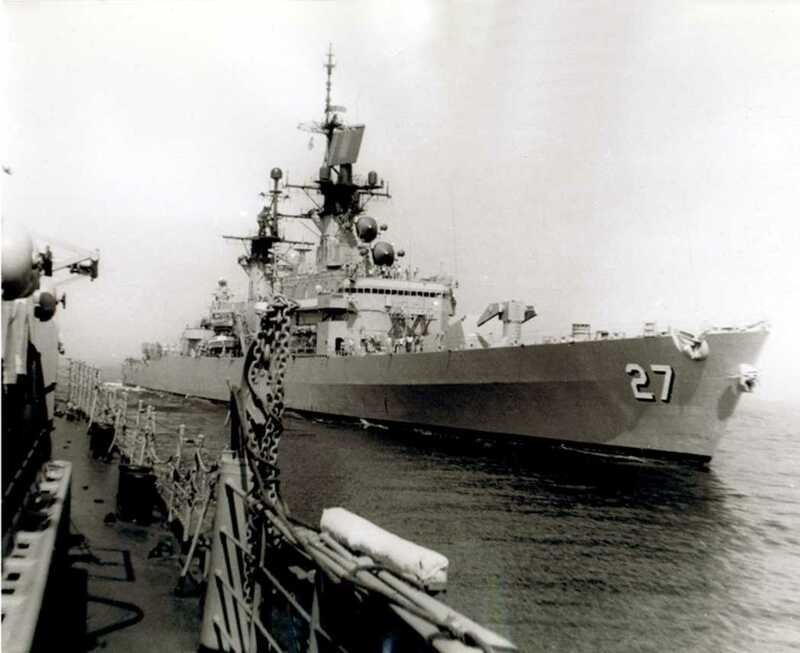 The cruiser is one of five U.S. Navy ships taking part in Unitas XXXI, an annual, joint, a combined exercise involving the naval forces of the United States and nine South American nations. 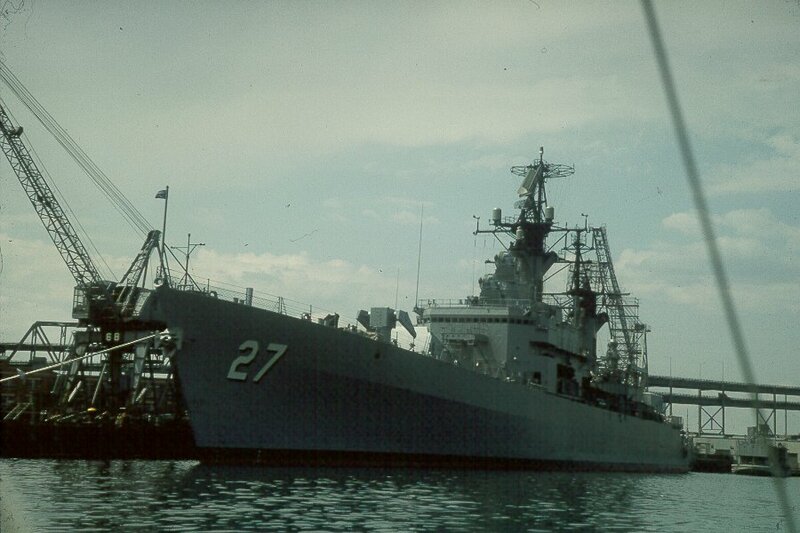 Photo by PH1 Michael Flynn, 01 July 1990. 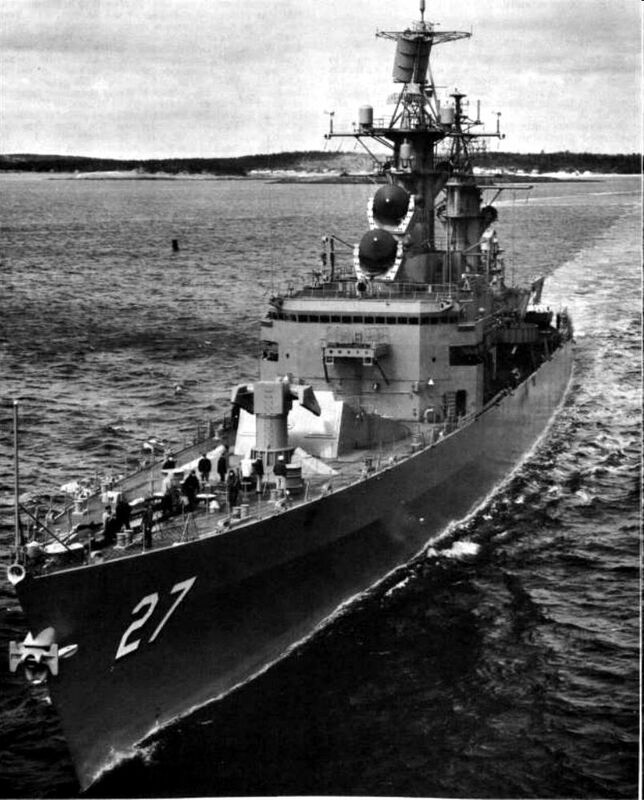 04012719 53k These pics were taken by me on 5 June 1995 at the MARAD reserve fleet at Fort Eustice, Virginia. 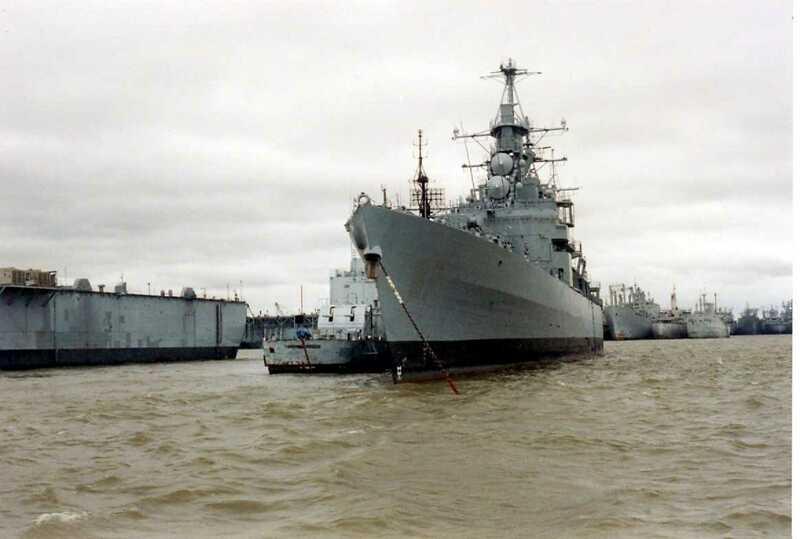 04012724 47k These pics were taken by me on 5 June 1995 at the MARAD reserve fleet at Fort Eustice, Virginia.